In the nonprofit sector, money drives mission. Well-managed budgets and investments can spur long-term growth and achievement, while financial mismanagement can damage or destroy an organization. Lynne A. Weikart, Greg G. Chen, and Ed Sermier—in their exciting new text geared wholly to nonprofits—provide the financial tools nonprofit managers need to thrive in pursuit of mission success. Given the wide array of nonprofit managers' backgrounds and a common fear of "the financials," the authors explain financial concepts without leaning unnecessarily on intimidating jargon. The result is a practical, accessible resource the prepares the next generation of nonprofit managers in financial planning and analysis as well as conventional and entrepreneurial financial management. 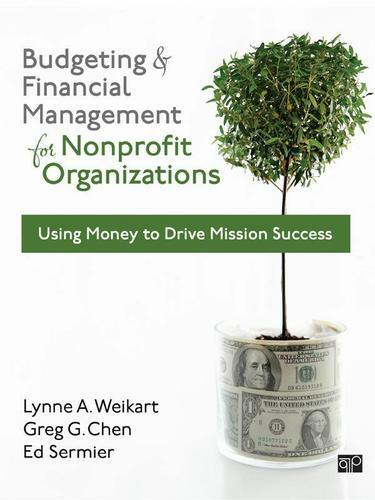 Grounded in real-world cases and offering plenty of opportunity for application and practice, Budgeting and Financial Management for Nonprofit Organizations helps readers develop a stable fiscal foundation and sound financial strategies for their organizations to prosper in times of economic expansion and contraction.